On December 6, 1992, over 3,500 fans were treated to an unforgettable evening at Carnegie Hall in New York City. Avraham Rosenblum and the original members of the Diaspora Yeshiva Band regrouped for a month long reunion tour that kicked off with this historic concert. 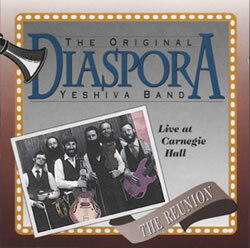 “The Diaspora Reunion” captures the band performing their greatest hits along with the incredible energy of that concert.